Secure life insurance once you’ve secured the wedding ring. Are you recently married? If so, congratulations! 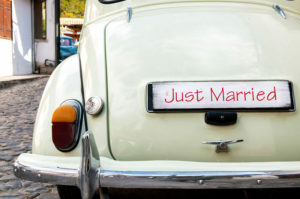 While life insurance may be the furthest thing from your mind right now, newlyweds are smart to consider this important coverage. Once you get back from honeymooning, be sure that you understand why your new partnership should have life insurance coverage. You’re adding more expenses. Couples often use their combined incomes to take on bigger financial obligations, such as renting a bigger apartment or buying a home. Many couples wouldn’t be able to bear these costs on just one income. One of the primary reasons for buying life insurance is income replacement, so that your family can continue their plans and lifestyle. Your spouse could be responsible for your remaining debts. If you pass away with remaining debt, the repayments could fall to your spouse. If he or she has to pay other expenses, such as the rent and raising a child on one income as well as taking on your debts, he or she may face serious financial hardship. It’s better to start early. Generally, younger people are in better health. Because of a low age and good health, you can lock in a low life insurance rate. The prices you’ll be quoted for policies will get more expensive with each passing birthday. What’s more, if you or your spouse develop a serious illness or take on a new habit (such as smoking) in later life, it could be hard to get any life coverage at all. Talk to the professionals at Abbate Insurance Associates to secure the right life insurance for your needs and budget in New Haven, Connecticut.